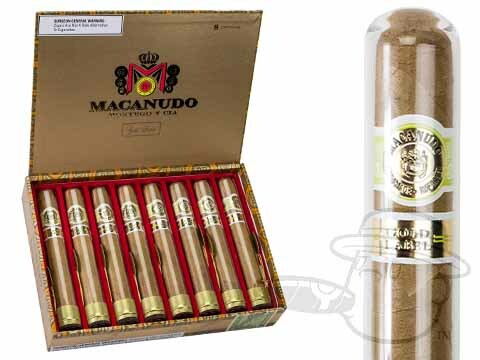 Macanudo Gold Label Crystal Tubos delivers ultra-smooth Dominican flavor in a 5 1/2 x 50 Robusto Extra vitola, beautifully presented in individual glass tubes. I purchased these cigars for my son-in-law for Father's Day. He will be visiting the Galapagos Islands in July. I figured he needed a better stick than he usually smokes, plus the added bonus of the tube to keep them fresh in the tropics and easy packing. He opened the package before Father's Day since he knew they were from Best Cigars. He was thrilled. He hasn't smoked one yet and I'm hoping he saves one for me sice we are caring for my granddaughter for 18 days. I bought these to take with me on a trip to Nicaragua. Believe it or not it's hard to find quality cigars there on the local markets. Macanudo's consistent quality is reflected in these cigars and I enjoy them. Macanudo Gold Label Crystal Tubos is rated 4.9 out of 5 based on 3 customer ratings.